Morocco’s liquid treasure flows above and below ground. And that means WATER. To more fully understand this amazing country, I did a little investigating about the relationship between long sun hours (see my blog on solar power in Morocco) and the ground beneath our feet (see my blog about the sand and gravel Sahara), and the correspondence of sun and sand to the availability of water. After all, everything depends on water. 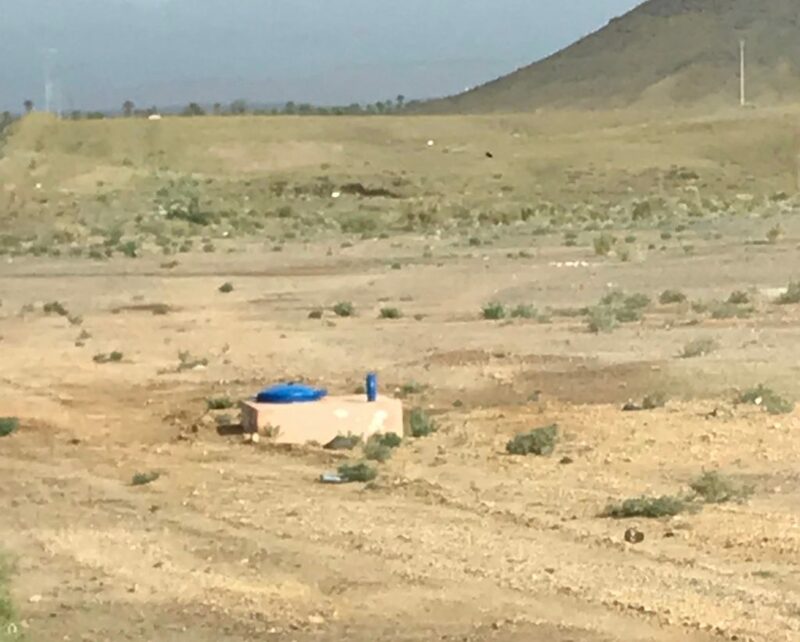 Along the sides of the roads throughout Morocco, you can spot cement boxes with a colorful lid shape on top. These are government wells. Our guide explained that for a fee, land owners can access water for crops and flocks. Look below at the difference water makes! Green fields thrive in this desert land because of the wells. Smaller holdings are divided by rock walls, and where many come together, it takes on the aspects of a veritable patchwork of different textures and colors of green. Interestingly, we often experienced hazy skies in Morocco (see below) instead of the signature brilliant blue. We followed rain showers across the country on a number of days in mid-September, which made for lovely temperatures but less dramatic photos due to the unusual humidity. 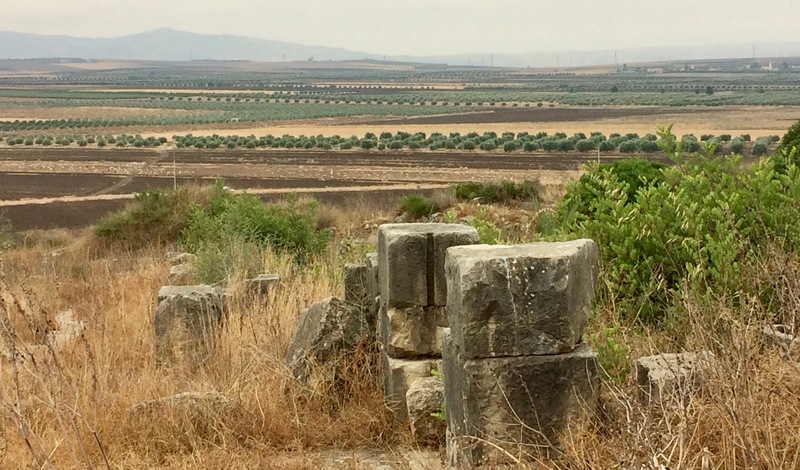 These highly productive fields adjacent to the large Roman ruin of Volubilis have been cultivated for centuries. Wherever rivers flow down from the mountains, wonderful greenery thrives on their banks. Always the touch of water means life. Researchers have found that massive amounts of water exist in the underground aquifers of Africa, including under the Sahara. In fact, estimates of these reserves indicate they may hold 100 times the amount of water available on the surface. Unfortunately, the topographical maps also indicate that the underground aquifers for Morocco hold very little water, or perhaps their reserves are now played out. So worrisome, since water is critical to all aspects of Morocco’s prosperity. 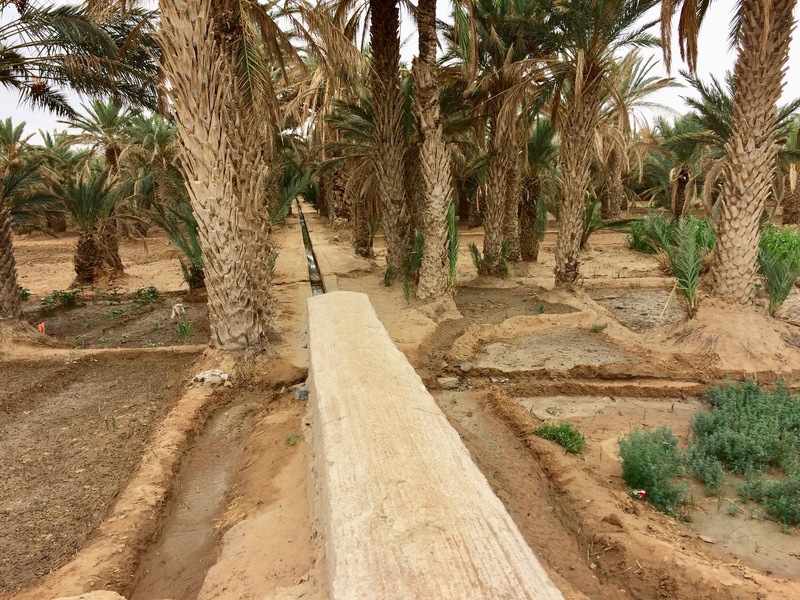 Irrigation throughout this desert land has mostly been made possible through the use of earthen canals (seguias). In fact, Satellite images show that these types of canals have been in use since ancient times. The photographs below come from the irrigation project near Tisserdimine, an oasis village at the bottom of Erg Chebbi. 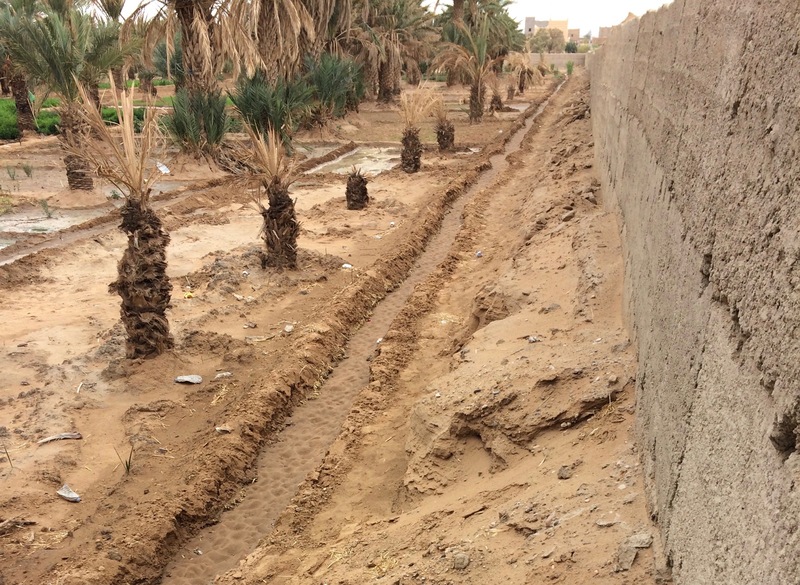 Builders have covered the waterway to conserve moisture and to direct the flow to the field to be cultivated, a typical move in desert climates. 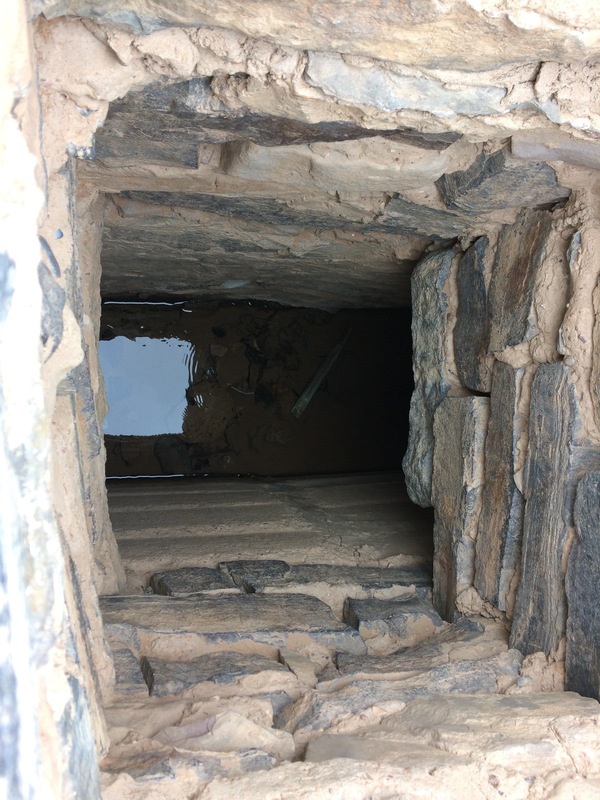 The round raised wells allow access to the canal in case a clog needs to be cleaned out. They also provide immediate access to drinking water for people and animals in the area. In the photo below, you can see how the covered canal ends in this oasis area where the water is carefully channeled to each plant. 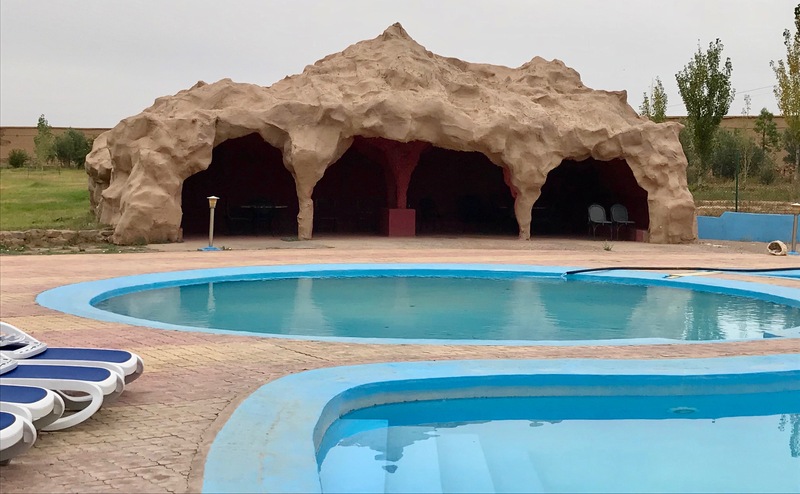 At first I didn’t see the purpose of the dried mud-brick wall to the right, which seemed to be a temporary structure lacking in aesthetic qualities. 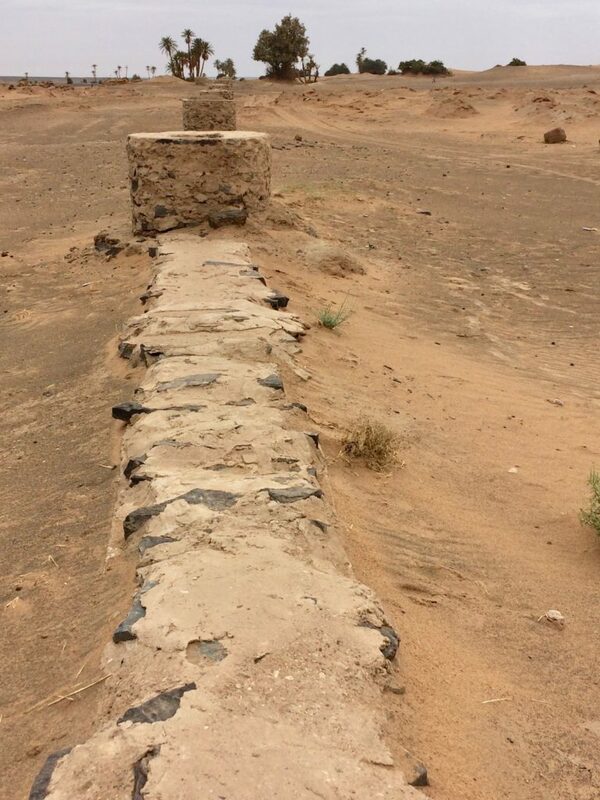 I learned, however, that in an area with very little rain and frequent sandstorms, that mud-brick wall is a relatively durable guard against encroaching sand dunes. 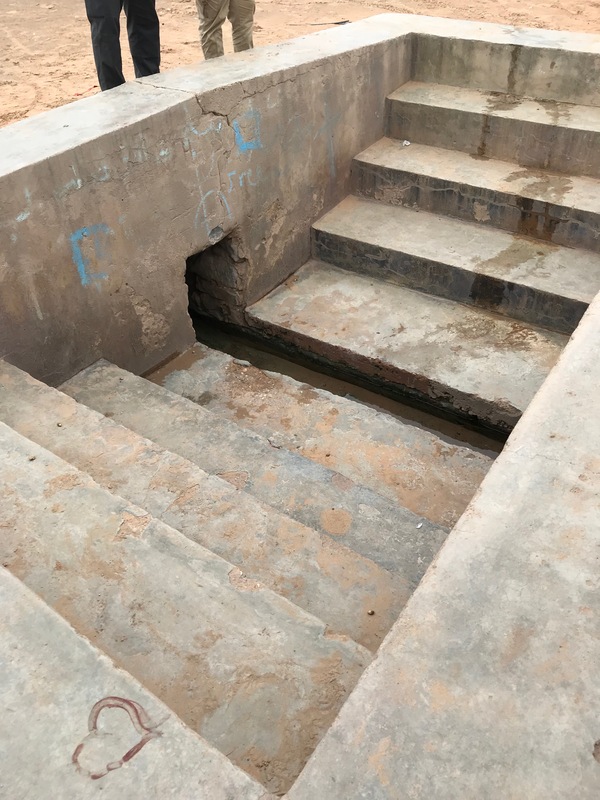 Most of the wells have vertical access with a bucket, but some will have steps allowing a person to walk down to the water source. The government’s current project of building a dam every year to promote Morocco’s massive solar project results in new lakes that appear in all sorts of places. These efforts seem bound to produce long-range benefits! 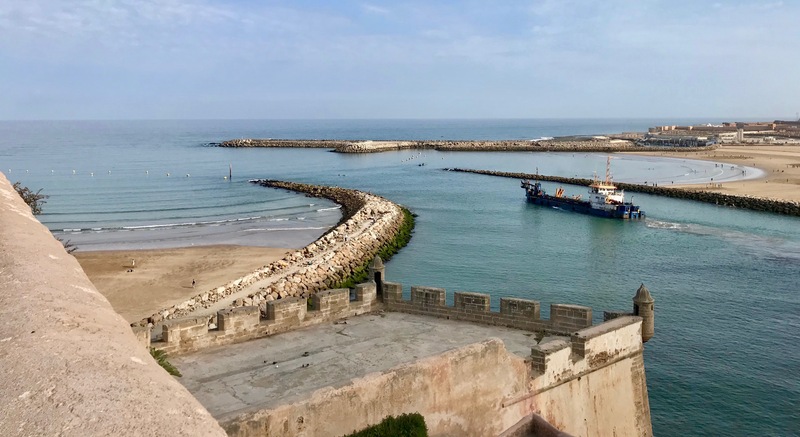 The photo above shows the view from the Kasbah of the Udayas (built in the 12th century by Muslim refugees from Spain) and built on the shore of Moroccos’s capital city, Rabat. In the upper right you can see across the Bou Regreg River to the ancient city of Sale, with the Atlantic Ocean above and to the horizon. 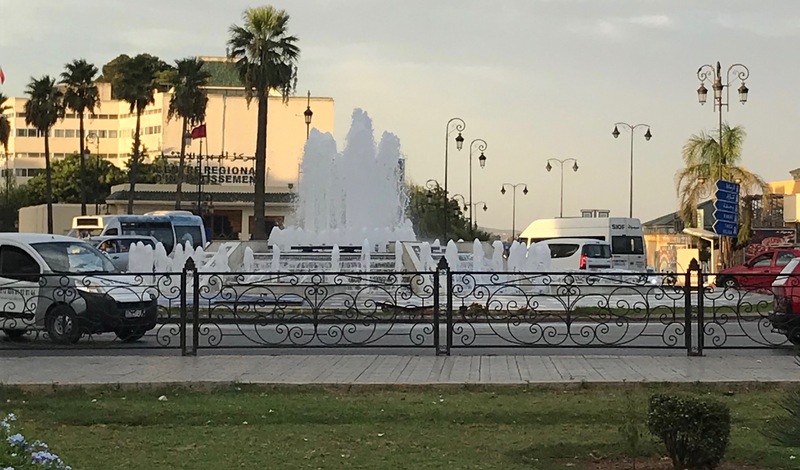 The Bou Regreg River flows down from the Atlas Mountains, zigzagging across Morocco, to reach the Atlantic Ocean between these two cities–Rabat with its French history and Sale with its pirate history. Think of the Barbary pirates? Or the origin of the word salacious? 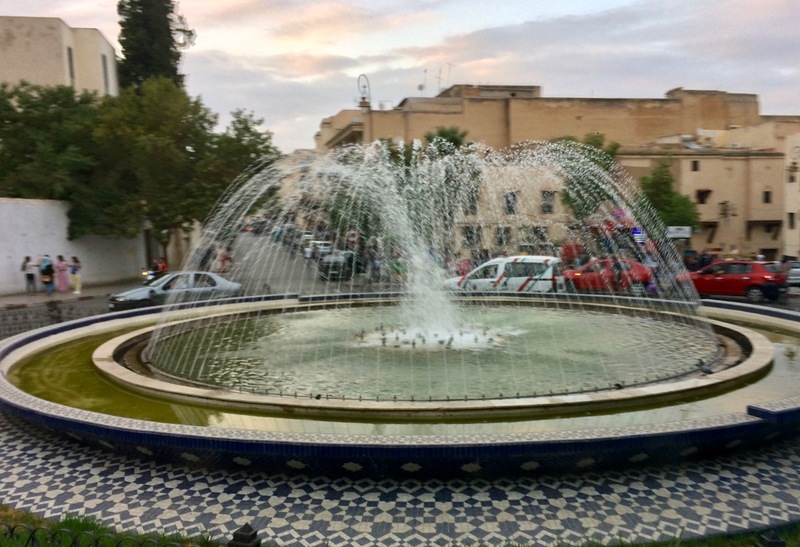 While some aspects of the city, Fes, may seem like medieval hold-overs (its amazing soukh, for example), but the city’s decorative fountains are modern and lovely. 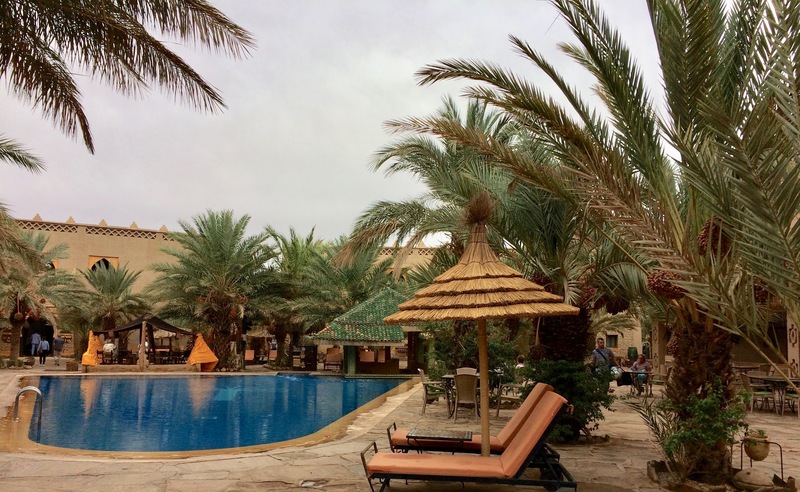 Also, at the end of every day we felt grateful to be tourists with access to the wonderful pools at the hotels, resorts, and kasbahs, usually with exotic designs. Such a wonderful feeling to come off a camel ride feeling half-dried inside and out, and then dip your entire body into cool water! I am learning a lot from your essays about Morocco. We saw much of the same irrigation gone underground in China. Good, solid information. Thanks. Thanks for reading. Friends like you keep me going! Thanks! I enjoyed the virtual tour.